We have already talked about adjectives and kinds of the adjective. 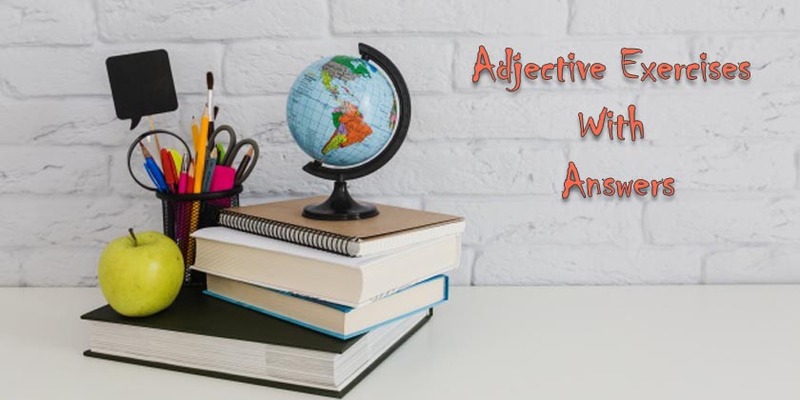 In the article below we have prepared adjective exercises with answers for ESL teacher or and students. Attempt the following exercises then compare your answers with the answers given below. Underline the common adjectives in the following sentences. Sentence number one is already done for you. 1. Carl used his new cell phone to call his younger brother, Mike. 2. The library is a good place to study because it is quiet. 3. Mrs. Franklin was enthusiastic about going to the gym. 4. My fishing pole was shorter than his. 5. A warm wind filled the white sails, and the makeshift raft glided out to sea. 6. After skating on the frozen pond for hours, I was happy to have a steaming cup of hot cocoa. 7. I bought the perfect dress to wear to my cousin’s outdoor wedding next month. Determine whether the boldfaced word is a proper noun or a proper adjective in the following sentences. Write PN for proper noun and PA for the proper adjective in front of the sentence. Sentence number one is done for you. 2. Her father visits Italy often. 3. While in France, we visited the Louvre. 4. The French Louvre is a world-famous art museum. 5. The Hollywood director had unparalleled talent. 6. Hollywood is part of the city of Los Angeles. 7. China is the world most populated country. 8. I don`t like Chinese food that much. 9. Afghanistan is a historic country. 10. Afghans are brave people. Ask your students to use the following adjectives in their own sentences. How to Change a Verb Into 2nd and 3rd Form?